Part of the Centre for Japanese Research Lunchtime Lecture Series. Title: Four Women – Four Lovers – Four Documents: female bodies and voices in Kishida Rio’s play Four Letters. Kishida Rio was the only female playwright in angura (underground/avant-garde) movement in 1960-70’s Japan. Kishida Rio began her work in theatre when she joined Terayama Shûji’s “Laboratory of Play” Tenjô Sajiki (The Peanut Gallery) in 1974 and worked as Terayama’s collaborator on plays and films, helping develop the company into one of the major angura experimental arts groups in Japan. She headed a series of her own theatre companies throughout her career, focusing on strong female characters, women’s bodies, and the use or loss of language. In 1989 Kishida wrote and directed Four Letters, a play for four of the core female actors in Kishida Jimusho + Rakutendan, the theatre company she ran with director Yoshio Wada. Four Letters is about four women at the funeral of the man with whom they were all in love. This play was unlike anything she had written to that time – or wrote afterwards. It consists of sparse text, repeated words, and intense physicality between the bodies of the actors and the dolls or puppets the carry with them. In this presentation, Colleen will talk about this unpublished play, and her work-in-progress translation of the piece. She will also discuss some of her research on Kishida Rio’s plays and Kishida’s work with strong female characters throughout her career. In particular, she will discuss the four “senior” female characters in her 1984 masterwork, Itojigoku (Thread Hell) which were played by the same four actors in Four Letters. 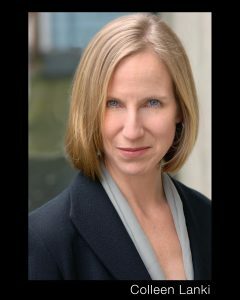 Colleen has been directing, choreographing and performing internationally for over two decades. She was based in Tokyo for 7 years where she studied nihon buyoh (Japanese classical dance), and noh and founded Kee Company, a group dedicated to intercultural, collaborative performance. She also worked as a voice actor. She has recently co-translated and directed Kishida Rio’s avant-garde masterpiece, Thread Hell for the University of Hawaii; performed in a world-premier of a new noh play about the Iraq War; directed Shadow Catch, a new-music chamber opera set in Vancouver’s Downtown Eastside; and choreographed and performed in Weaver Woman, a dance-theatre piece based on a short story by Korean writer O Chong-hui. Colleen is currently the Artistic Director of TomoeArts, a company that explores traditional Japanese arts and creates works of total theatre. TomoeArts’ next project is Kayoi Komachi/Komachi Visited, a chamber opera combining noh with western classical music. She is in the second year of her PhD studies in theatre UBC, where her research focuses on the work of Kishida Rio. Publications include a co-translation of Kisaragi Koharu’s play MORAL (Asian Theatre Journal), a section on dance in Japanese traditional theatre in the The Routledge Handbook of Asian Theatre (2016) and “The Body in Space: Layers of Gender in Japanese Classical Dance” in Performative Body Spaces: Corporeal Topographies in Literature, Theatre, Dance and the Visual Arts (Rodopi 2010).